Welcome to the St. Philip Media Page where we feature Living Real Radio, FORMED online Catholic media, our Sunday Homily Podcast, talks from our special events and the latest in Catholic mobile apps. Join Living Real Radio at 8am every Sunday Morning on Nashville’s Hippie Radio 94.5 with St. Philip staffers, John Angotti, Greg Walton, Julianne Staley and Holy Family parishioner, Robert Feduccia. Focusing on faith, real life and real issues, each show features special guests, thought provoking topics and inspiring music. Catch past episodes here on our Media Page, SoundCloud and Apple Podcast! Imagine Your Home Totally Organized! St. Philip Has Purchased a Gift for You! Enjoy a free subscription to FORMED.org — an incredible online gateway to the best Catholic content, all in one place! 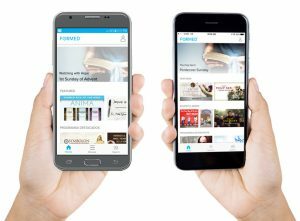 FORMED provides amazing content 24/7 for you to grow in your faith. It’s FREE and EASY to Register! Three minutes of peace are at your fingertips. Download Loyola Press’s free app, the 3-Minute Retreat, for a peaceful prayer experience that helps you re-connect with God, re-center your day, and relax, wherever you are. Every day, the app guides you on a new bite-sized retreat filled with Scripture passages, soothing music, and reflection questions that you can pray at your own pace. Join the thousands of 3-Minute Retreat users who return each day to enrich their spirituality and rest in God’s loving presence. Begin your retreat today! Those three minutes of peace are just a click away. Flocknote is a smarter way to send emails and text messages to your sheep (and by sheep we mean your church or ministry members, not actual sheep, they can’t read). Cut through the noise, reach your people and hear back from them. Measure your success with our snazzy analytics. Flocknote is so simple your whole leadership team can actually use it (really!). It is easier than ever for you to enjoy your subscription to FORMED! Just download the FREE FORMED app and start enjoying great video and audio wherever you go. Get the app and share it with your friends and family. FREE Electronic RSV-2CE Bible • Ignatius Catholic Study Bible • Truth and Life Dramatized Audio New Testament • Over 100 Lighthouse Talks • FREE Audio Bible Commentary from Dr. Scott Hahn • And more! Holy Rosary Audio is the world’s first Rosary with complete audio for iPhone and iPod touch. The graceful touch screen interface design will bring you a fabulous praying atmosphere on the go. It encourages you to listen and read the Words of God wherever you go and it is also a great Christian gift to share with your friends and family. Liturgical Calendar: Full calendar displaying all of the liturgical seasons. Mass Readings: All the Mass Readings for every liturgical cycle (A,B,C,I,II) are included! Audio of the Mass Readings. Audio is only available for more recent dates (sliding window of aprx. 30 days). * WIFI connection recommended for optimal playback of audio files. Order of Mass: Ever wish you could follow along in Mass and have all the prayers, responses, etc. available. Now you can. Great for RCIA candidates that are new to the faith. Version 3.0 includes many enhancements, now, fully complete! Mass Videos: Cantcha, Inc. has teamed up with CatholicTV.com and now provides videos of the Mass for you to watch. * WIFI connection is required for optimal playback of videos. Videos are of high quality. Our Daily Bread: Get a unique Bible verse for every day of the year displayed on 20 plus beautiful backgrounds. Prayers: Over 100 of the most popular Catholic prayers are included. Save your favorites. Email your favorite prayers to your friends. Catholic News Feed: Stay up to date on import Catholic News and events. Updated frequently. Available in English, Español, Português, Française, Deutsch, Nederlands, Slovenský, Italiano, Bahasa, Polski, Slovenski, Hrvatski, Việt, 简体, 繁體 and Românesc. Daily Mass Readings, Order of Mass, Liturgy of Hours, New American Bible, Latin Mass, Latin Liturgy of Hours, Rosary and Latin Rosary, Chaplet of Divine Mercy (on Rosary screen), Seven Sorrows Rosary, Chaplet of St. Michael, Holy Wounds Chaplet, St Jude Chaplet, Franciscan Crown Rosary, Stations of the Cross, Saint of the Day, Catechism of Catholic Church, Sacrament of Reconciliation (Confession), Daily Examination of Conscience, various prayers and prayers in Latin with English translation. Daily Prayer. Podcast for Rosary and Stations. Daily Meditations. Podcasts of Daily Readings with read-along text and meditations. Ability to bookmark prayers and create own categorized prayers. Export/Import for prayers. Edit prayers on your Mac or PC and Import into Laudate. Daily Bible Verse on Daily Readings screen. Douay-Rheims Bible for offline use. Second Vatican documents, Code of Canon Law and papal encyclical letters. Let us know about your favorite Catholic App.